Improve Your Vitality by Eating Salmon! Written by PJ Lobster House on March 15, 2019 . Posted in Blog, Fish Market. Salmon has many health benefits. Not only is this seafood delicious, but it can also help individuals with their overall health. Improve your vitality by eating salmon at PJ Lobster House! Salmon is one of the most popular seafoods. Individuals enjoy salmon because of its rich taste, as well as its versatility when used as an ingredient in meals. Individuals also enjoy salmon because of its many health benefits. Wild salmon is packed with protein, as well as DHA and EPA, which are omega 3s. These omega 3s assist with brain, nerve, and eye development. Because the human body cannot create omega-3 fatty acids on its own, eating salmon is an ideal way to get it. Salmon can also help with the treatment of osteoarthritis or other inflammatory joint conditions. 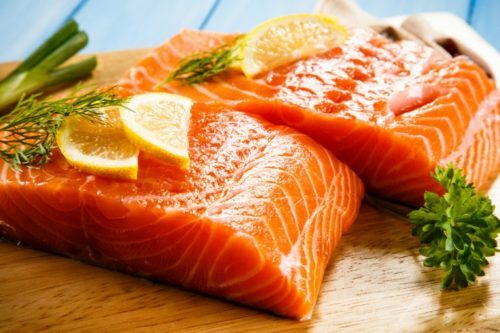 Salmon contains bioactive peptides, which are a type of protein known to increase, regulate, and stabilize collagen synthesis in human osteoarthritic cartilage. It can also improve bone density and strength. The brain is 60 percent fat. Omega-3 fatty acid DHA helps the brain function and allows for a healthy nervous system. By eating salmon on a routine basis, individuals can actually reduce their risk of getting depression and slow down their cognitive decline as they age. Salmon is also beneficial for children’s brains. If you are pregnant, eating salmon can actually help boost your child’s learning capabilities and academic performance. It’s also an excellent source of vitamin D. Vitamin D is an essential vitamin that has been known to reduce the risk of cancer, cardiovascular disease, multiple sclerosis, rheumatoid arthritis, and type one diabetes. Make PJ Lobster House your source for salmon! You can order a salmon dish at our restaurant or purchase salmon from our fish market. PJ Lobster House is located at 1 North Country Road in Port Jefferson and we hope to see you here soon!